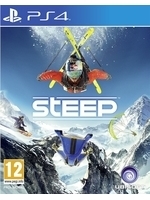 Ubisoft has launched Steep's open beta that will run until Novembre 21. This portion of the game allows you to discover some zones and unlock some others while you progress. The title will launch in two weeks, December 2. Completely forgot Steep's open beta. Don't know if I'm gonna have the time to test it properly, but gonna try playing a few matches to see how well it plays. Thanks for the heads up. It's already in Uplay to DL. Doesn't it require Uplay anyway? I don't buy any of my Ubisoft stuff on Steam because it seems weird to require two launchers. Most likely. I just like to have as much as possible through Steam even if it means Uplay starts as well. Ahhh didn't realise it was on steam d'oh! I have to use uplay because I buy my keys cheap. Gave it a try and the gameplay did not feel good. I was hoping for a more arcady game and this just felt stiff.